Explosive material removed from suspect's apt. (CBS/AP) AURORA, Colo. - Authorities on Saturday removed dangerous explosive materials from inside James Holmes' suburban Denver apartment a day after police said he opened fire and set off gas canisters in a suburban theater minutes into the premiere of the Batman film "The Dark Knight Rises." The attack left 12 people dead and 58 injured. His apartment was rigged with jars of liquids, explosives and chemicals that were booby trapped to kill "whoever entered it," Aurora Police Chief Dan Oates said, noting it would have likely been one of his officers. All hazards have been removed from the Holmes' apartment and residents in surrounding buildings can return home, police said. The exception was Holmes' apartment building, where authorities were still collecting evidence. Inside the apartment, authorities began covering the windows with black plastic to prevent onlookers from seeing in. Before they did, a man in an ATF T-shirt could be seen measuring a poster on a closet that advertised a DVD called "Soldiers of Misfortune." The poster showed several figures in various positions playing paintball, some wearing masks. Earlier, bomb technicians were successful in deactivating an explosive device installed in the apartment. Officers are evaluating a second disarmed explosive with a robot-mounted video camera. Earlier Saturday, bomb experts executed a controlled detonation of a triggering device in the apartment. The bomb crews were faced with deactivating an explosives-laden booby trap that had been set up in the home of James Holmes. Examination of the explosives by bomb experts from the FBI Lab in Quantico, Va., revealed that a trip wire (possibly fishing line) was set up to trigger a liquid container to mix with another, setting off the main charge of the device, which may be additional flammable liquids. Also in the apartment were about 30 aerial shells (or fireworks) the size of softballs, black in color and made of mostly rubber. They are believed to be filled with smokeless powder. Depending on how the powder was packed, the devices could either detonate or just burn. 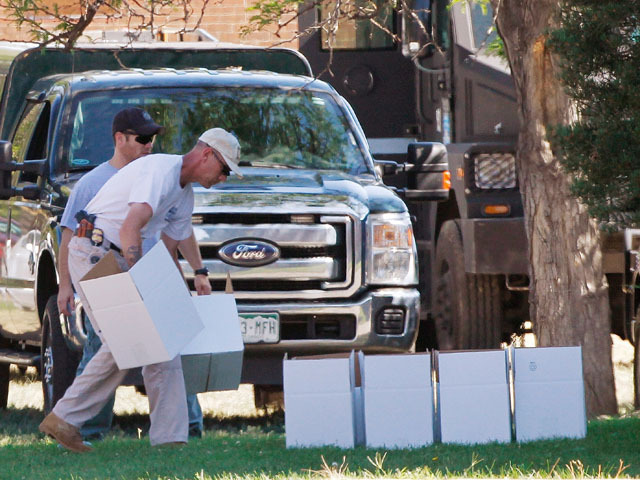 Outside the apartment, police arranged plastic storage boxes and large white plastic bags, possibly for evidence, although no officials were available to confirm the purpose of the containers. Police said the apartment was rigged to detonate on a presumed police entry when the suspect set up loud music to be playing, while he was on his way to the movie theater. First responders would then be sent to the apartment, on the opposite side of town where the gunman planned to wage his assault. Having evacuated the apartment complex, police this morning were seen towing vehicles away to clear the immediate area. Bomb technicians on a fire truck's crane were seen maneuvering a triggering device through the broken window of the apartment. Shortly afterwards, a sire sounded, and a muffled boom was heard. Rendering the apartment safe for entry is an enormously dangerous mission. About 100 personnel are on the scene, including firefighters, ATF and FBI bomb technicians, and chemists to assess the risks of potential accelerants seen inside.